The Calling of Matthew is the first event of the Gospels that is imagined in the novel: for this is obviously the first time that we can have Matthew meet Jesus. The Calling of Matthew is an episode in the life of Jesus which appears in all three synoptic gospels, Matthew 9:9-13, Mark 2:13-17 and Luke 5:27-28, and relates the initial encounter between Jesus and Matthew, the tax collector who became a disciple. The Greek: τὸ τελώνιον (to telōnion) is often translated as “the tax collector’s booth” (e.g. NIV) or “tax office” (e.g. RSV). The King James Version says Matthew was “sitting at the receipt of custom”. Wycliffe’s translation was “sitting in a tollbooth”, and the Expanded Bible suggests that the telōnion was “probably a tariff booth for taxing goods in transit”. So Matthew was collecting taxes for the Romans when Jesus told him he wanted him as a follower, and Matthew accepted. Jesus was intent on calling all Jews back to full observation of Judaism, and this included even a foreign-born non-practicing Jew who was working for the Romans. He naturally expected Matthew to repent and fall into line, giving up the things that marked him as pro-Roman. Full observation of Judaism – Jesus wanted the observation of every “jot and tittle” of every religious law (Matt. 5:18) – inherently required the refusal to accept Roman laws (market days falling on the Sabbath, Roman coins with graven images, temples for Roman gods including emperors, etc) and Roman customs (beardlessness, eating pork, etc). So those are the Gospel issues around the ‘Calling of Matthew’. But this is a novel… we can also create some colorful asides for the story, can’t we? Which is why I have called the chapter “The Rug Merchant”, and used it to introduce not just Jesus but also Judas. Judas is key to my understanding of the activities of Jesus. In the Gospels he is given the name Iscariot, and there have been unfounded statements to explain this name such as that he came from the town of Karioth which, as far as I can tell, has never existed. To me the word is much more evocative of the term Sicariot, which literally means “dagger-carrying man” and was one of the terms the Romans used to describe the Zealots of the resistance – along with other dismissive terms like “robber”, “brigand” and so on. So, given that Jesus was working to bring all types of Jews back to a state of purity, Judas looks good as a representative of the Zealots… along with the second Simon among the Twelve, Simon Zealotes. Simon the Zealot. It would be natural for Jesus to have had close contact with the Zealot resistance, because he was hostile to the Romans for their desecration of Palestine in general and the Temple in particular. Several of the events of the Gospels which seem bizarre or puzzling in the narratives as influenced by Paul, look natural or commonplace when looked at in the context of opposition to the Roman occupation. They will all be dealt with in the course of this novel. The disciples were forbidden to carry money – but Judas kept the movement’s money. He had a special relationship with Jesus, and a special place in the movement. Zealots, being egalitarian and recognizing only God as their Lord, called each other “Friend”. Judas is the only disciple addressed as “Friend” by Jesus. Judas led the Romans to Jesus, but not necessarily of his own free will. He died violently immediately afterward. He was found hanged (Matthew) and with his belly split open and his guts spilled out (Acts). The Romans claimed it was suicide. Judas is called “Iscariot” in the New Testament. That name is obscure in meaning, and there have been suggestions that he must have come from the town of Karioth. Unfortunately, there is no record of exactly such a town name. In ‘The Gospel According to the Romans’ I suggest that the name is a deliberate corruption of “Sicariot”, to disguise the name of this very important person in Jesus’ story. A sica is a curved knife, the weapon of choice of urban guerrillas. A “sicariot” is a “dagger man”. 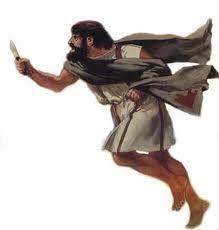 “Sicariot” was the common derogatory term for a Zealot, the armed resistance against the Roman occupation of Israel. Other terms used by the Romans were “thief” and “robber”. When Paul tried to spread his new religion into the Roman population at large, links between Jesus and the Zealots were problematic. Distortion and misdirection were necessary in a retelling of the story from which the Romans were largely omitted. Judas was too well-known to ignore; but at least his name and his role could be shifted, from Jesus’ friend the “Sicariot”, to Jesus’ betrayer the “Iscariot”.